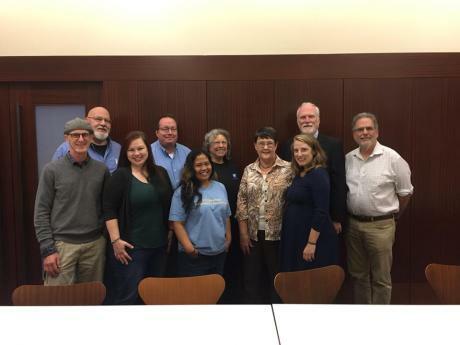 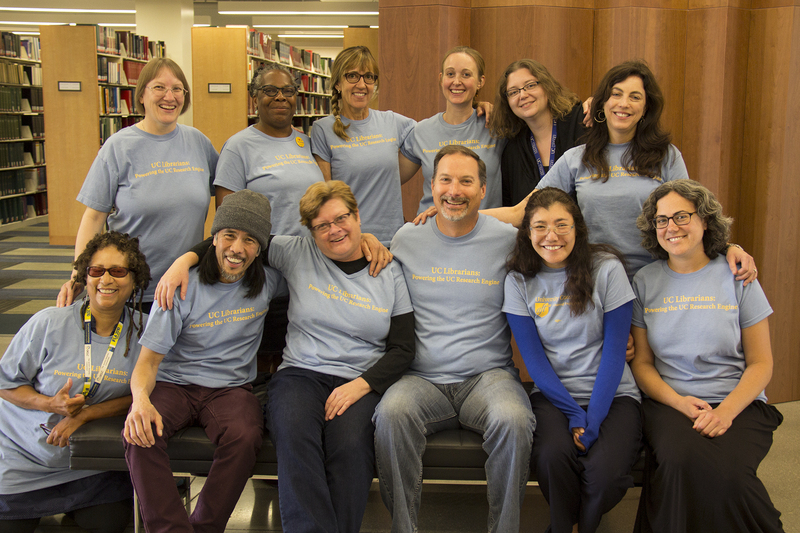 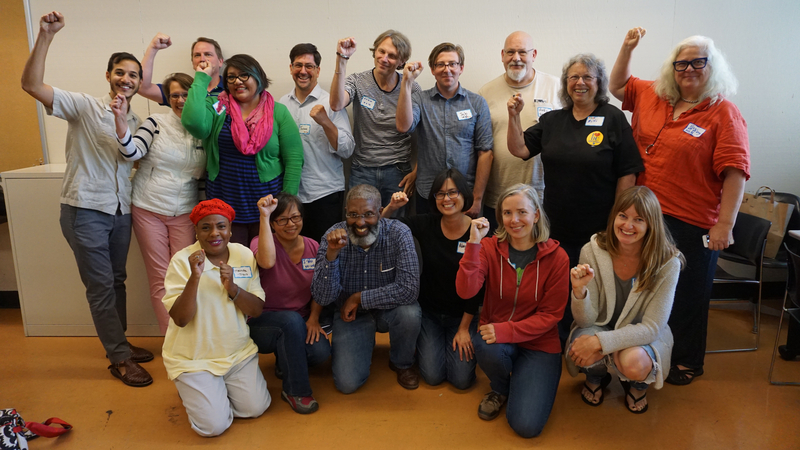 We held our 13th bargaining session on February 1st, at the Young Research Library on the UCLA campus. 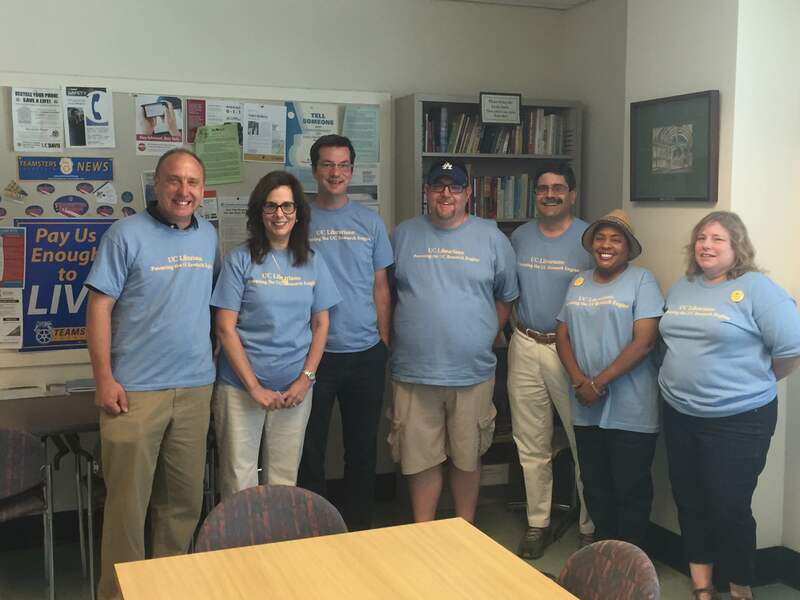 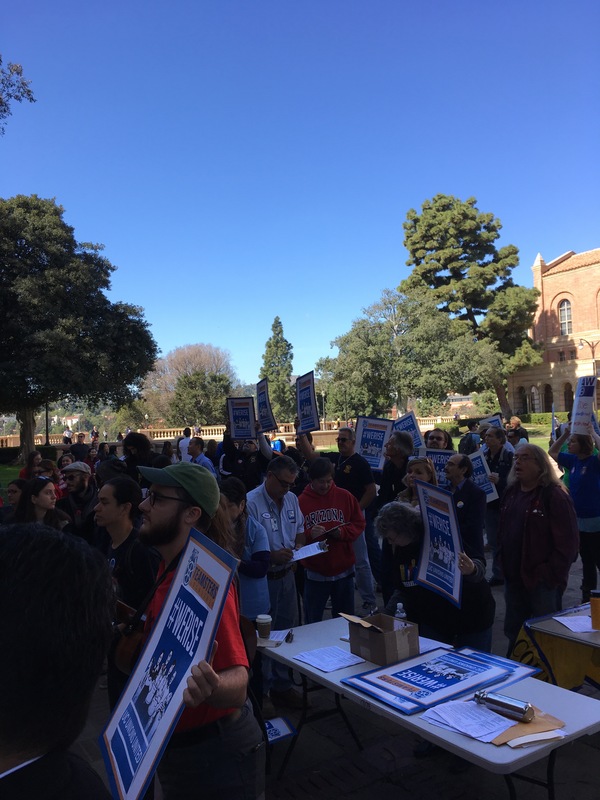 We started the morning in a negotiating room filled with posters created at UCLA over the course of bargaining. 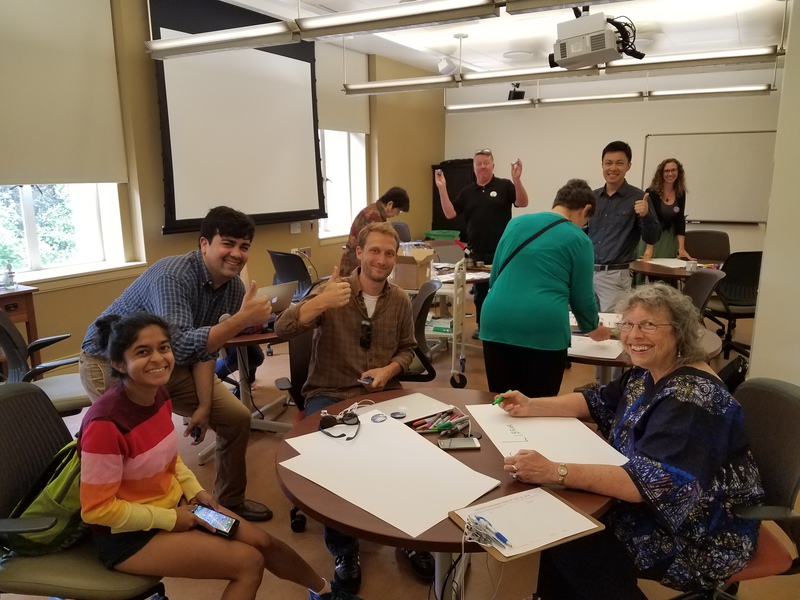 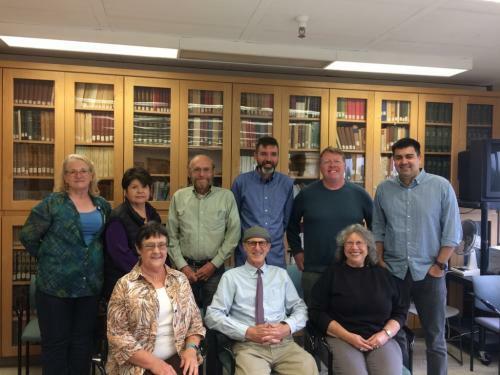 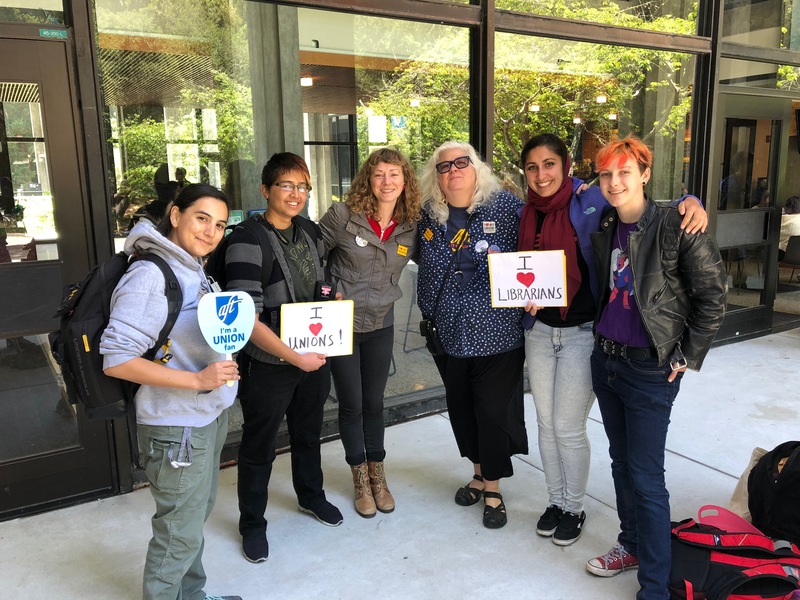 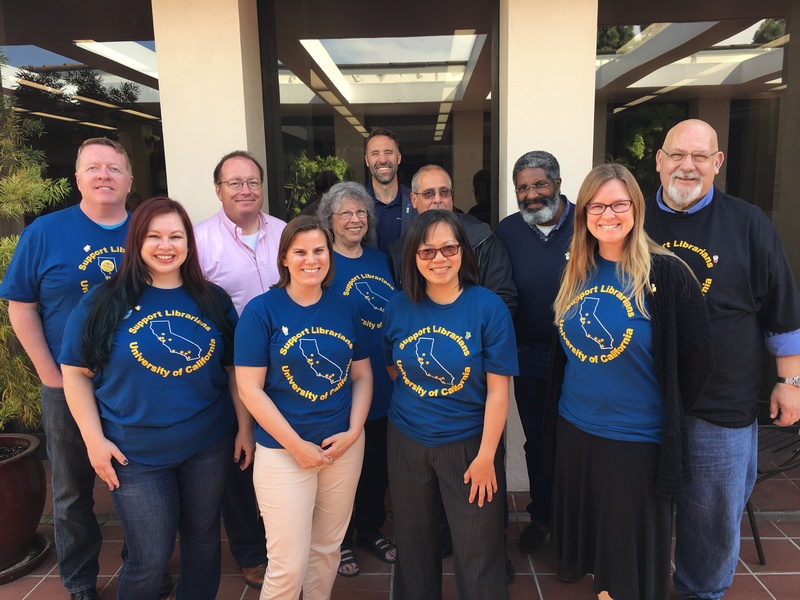 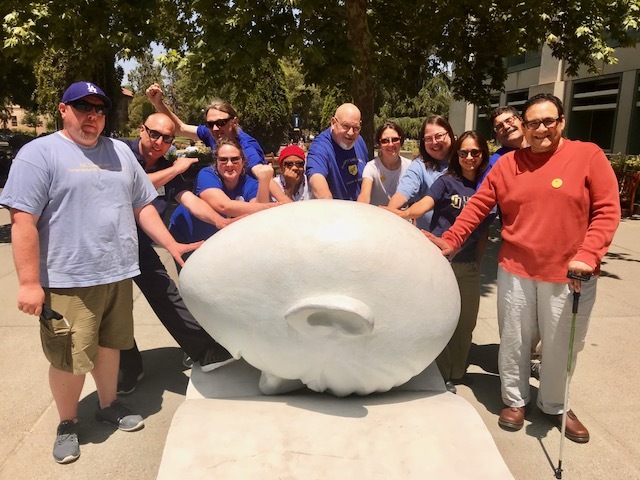 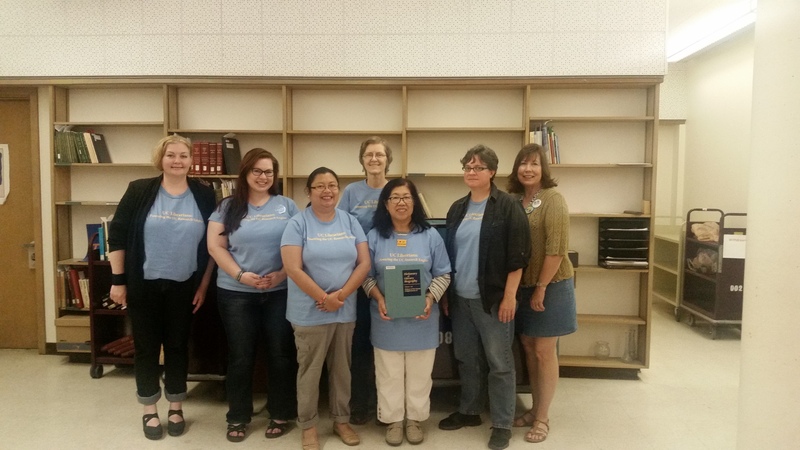 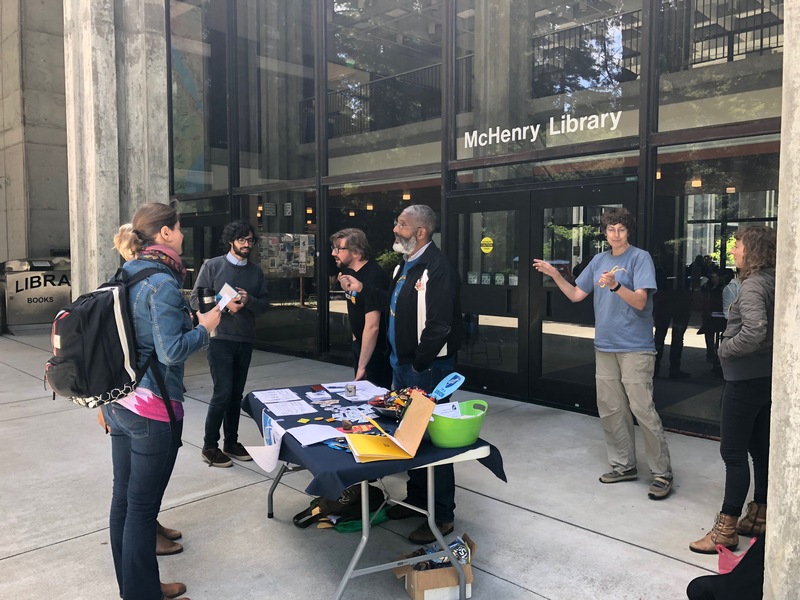 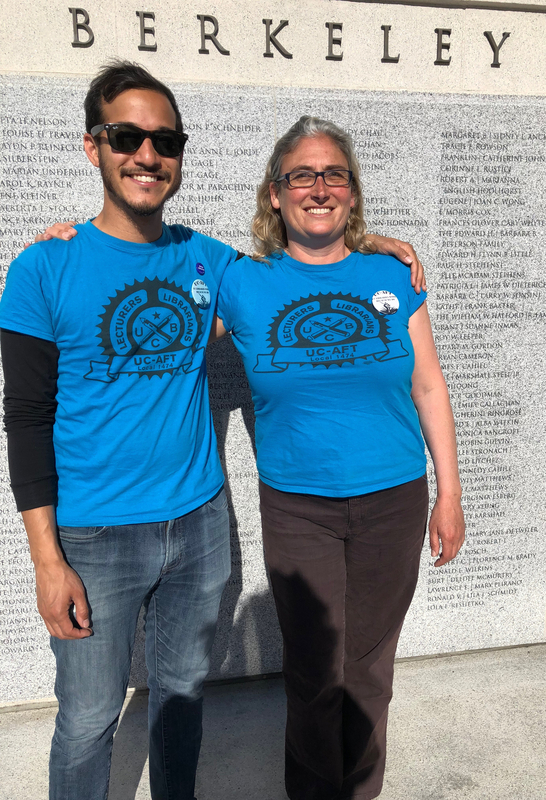 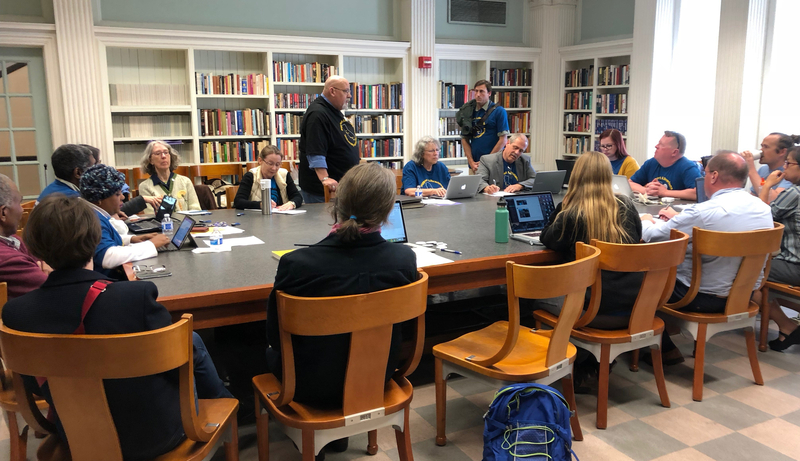 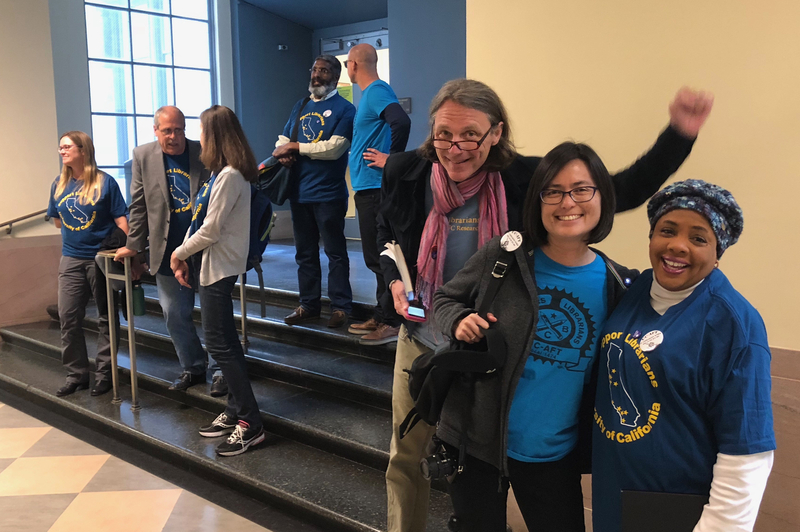 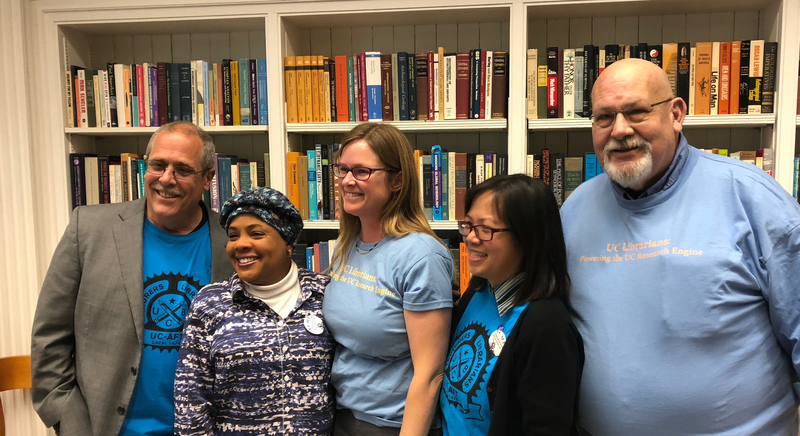 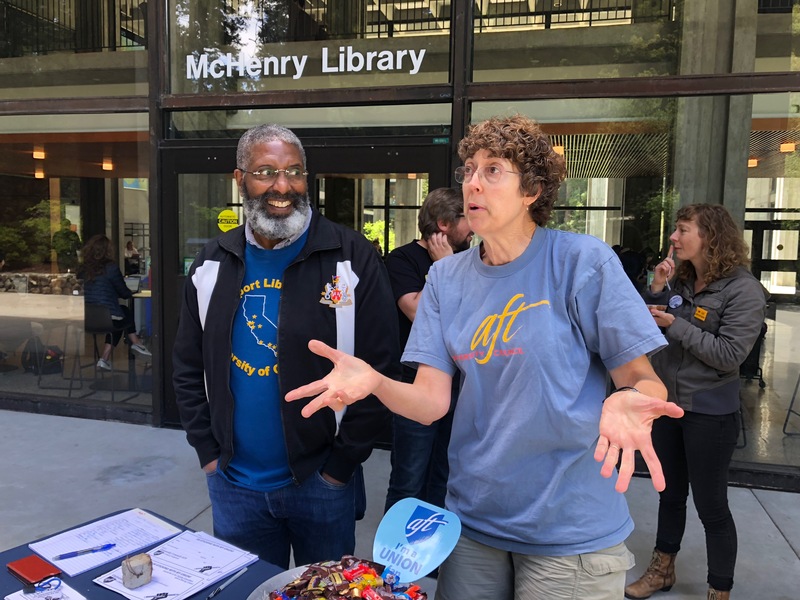 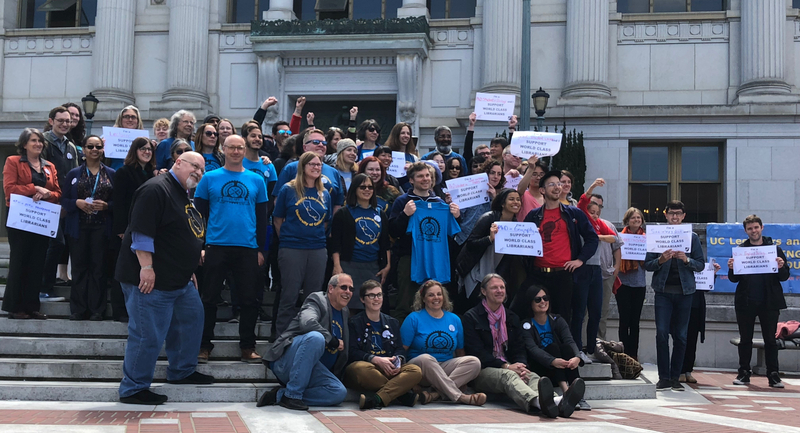 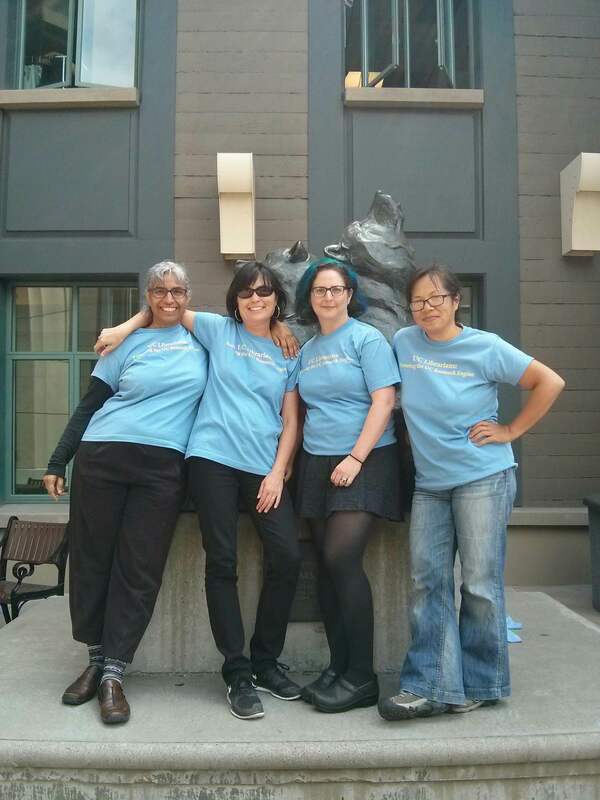 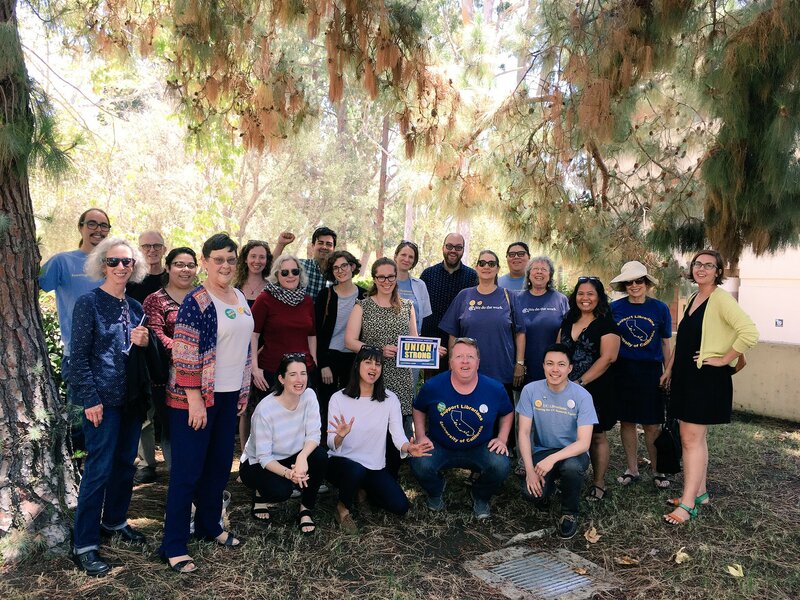 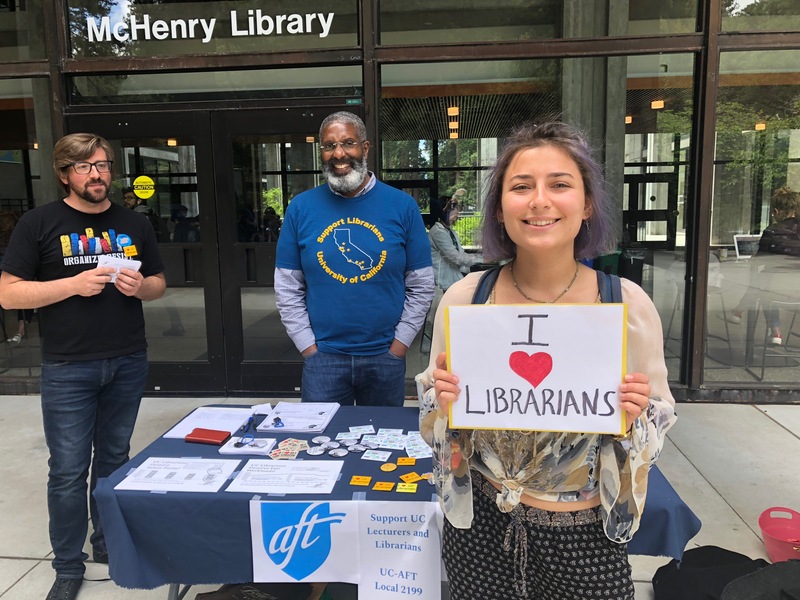 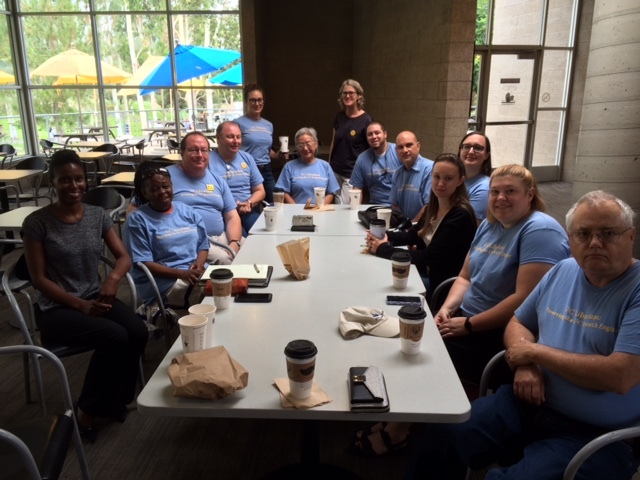 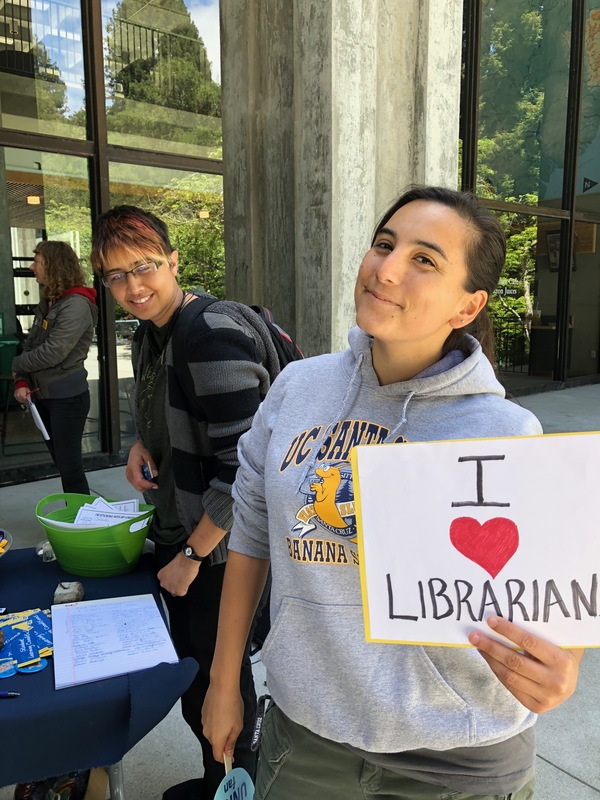 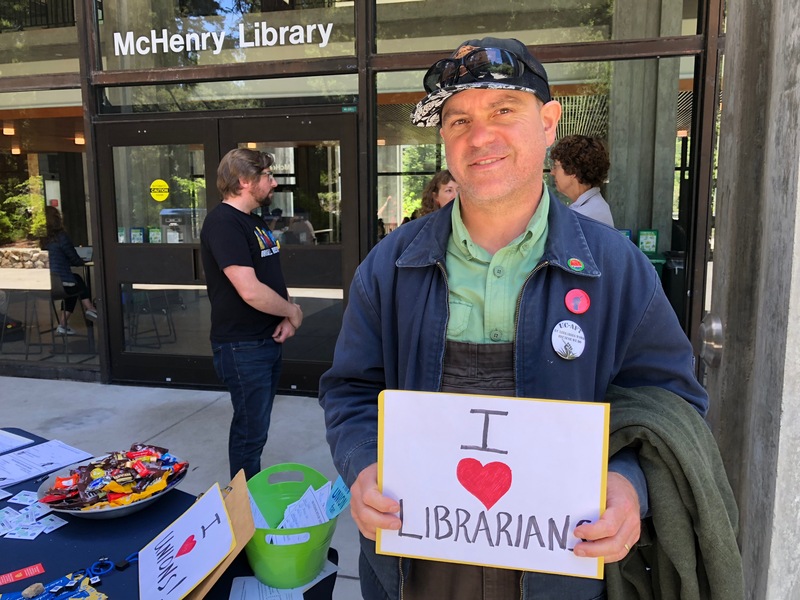 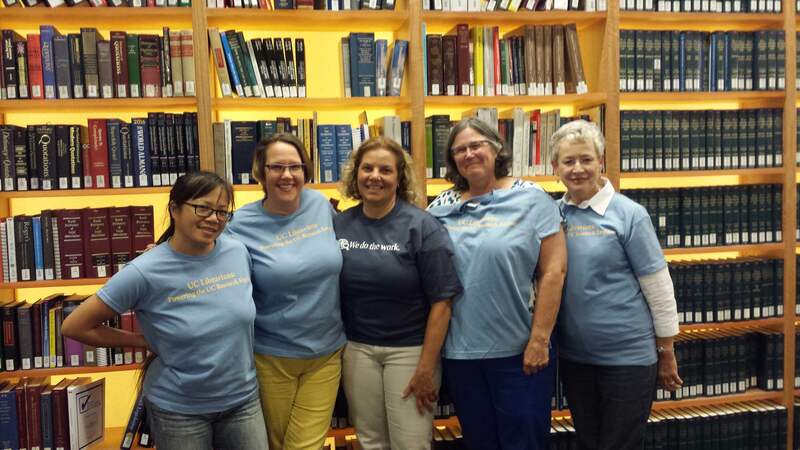 All of the Table team and our supportive observers wore stickers that say “Where’s Melissa?” – in reference to Melissa Haley, the Temporary Librarian from UCLA Special Collections who reached the end of her term of employment and was released from service just this week. 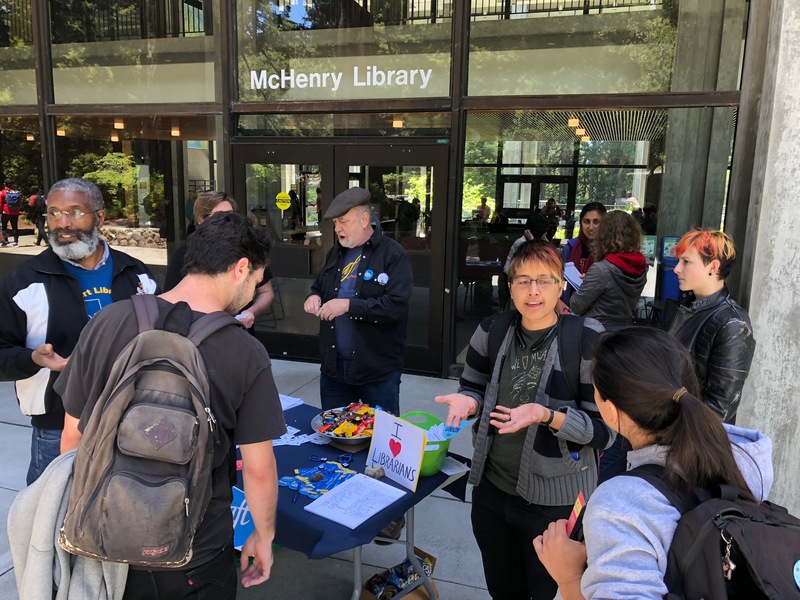 Tony DiGrazia actually asked “Who’s Melissa?” in reference to the sticker on Axel’s chest; Axel had to explain who Melissa is. 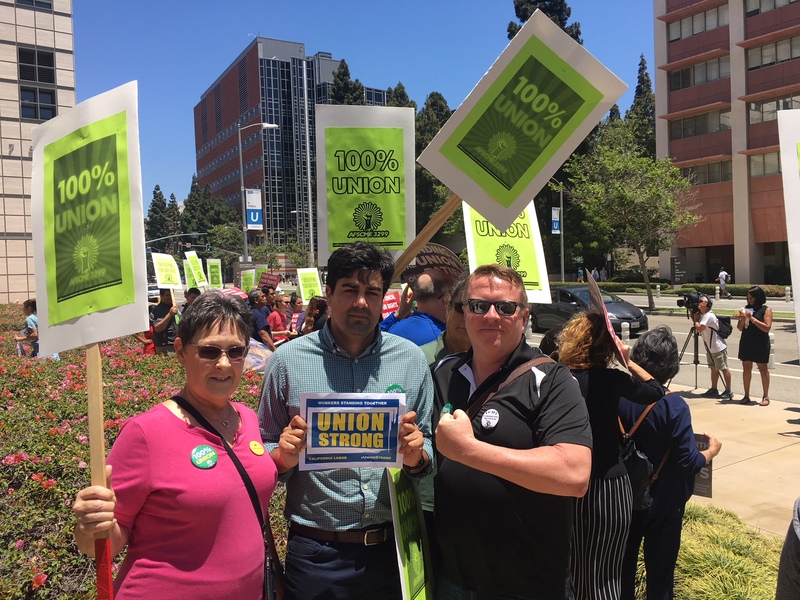 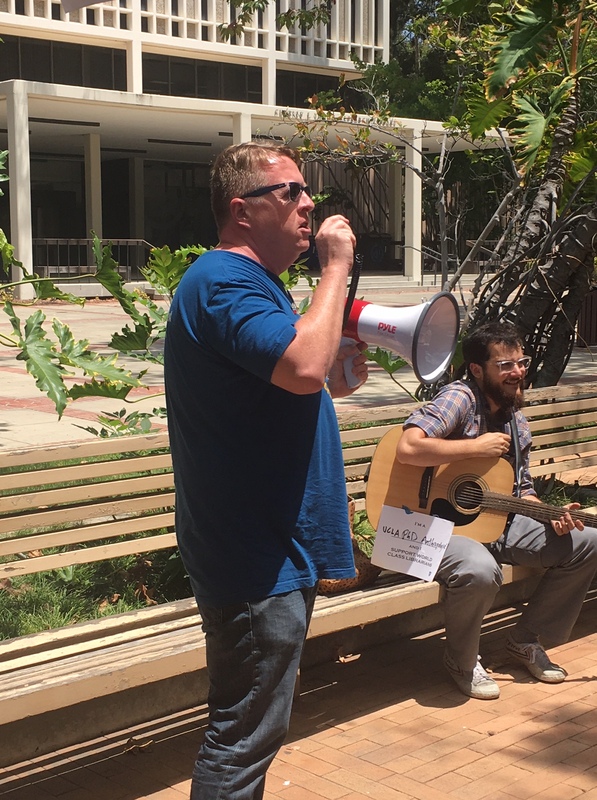 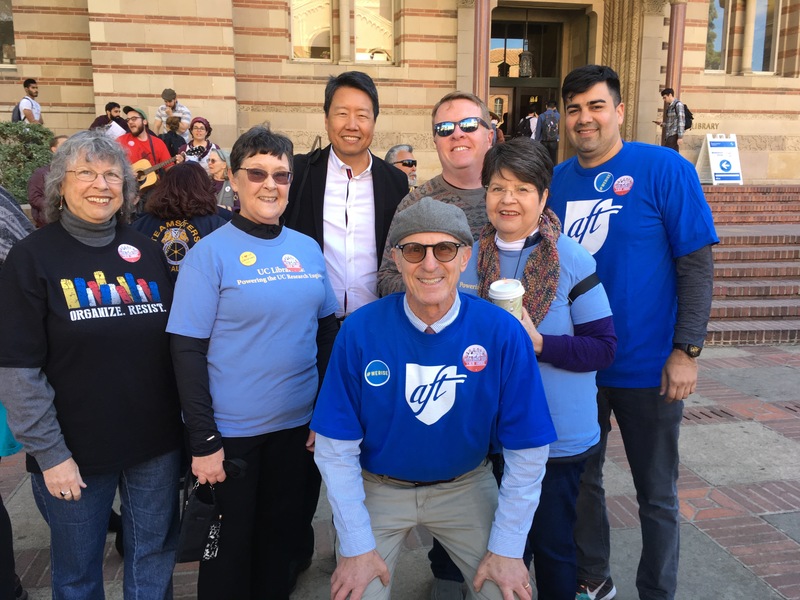 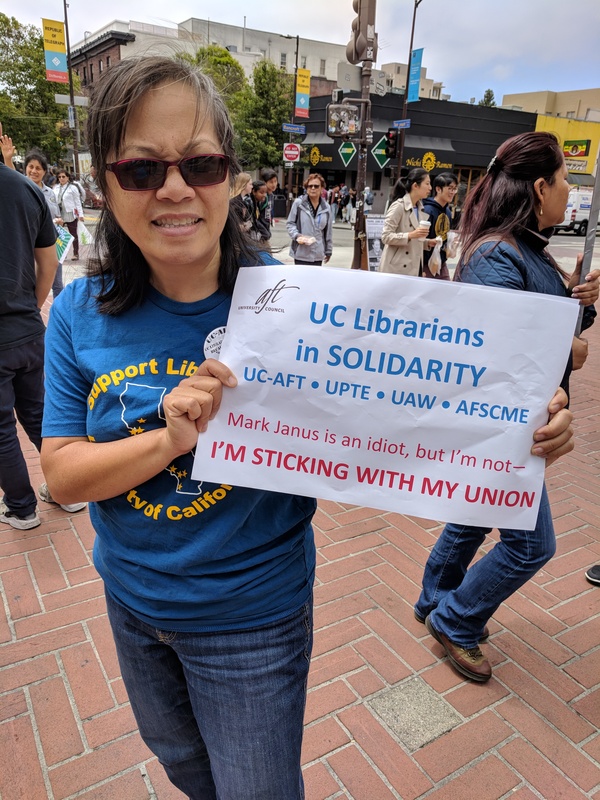 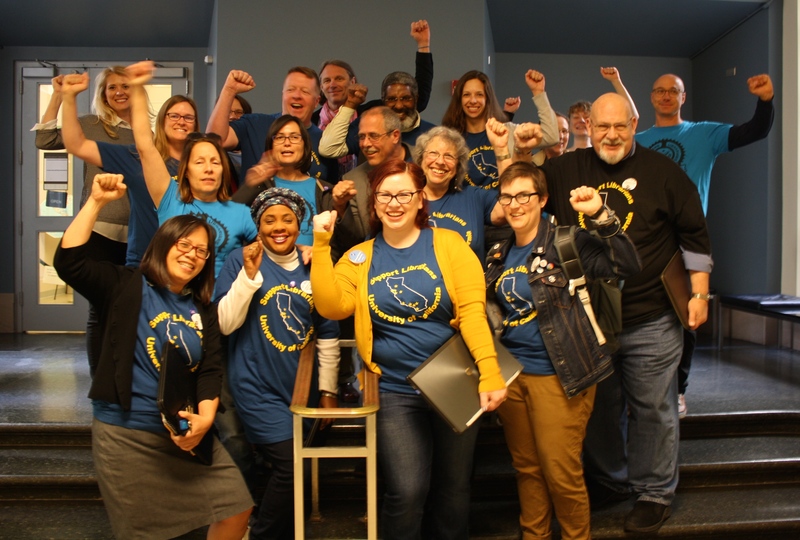 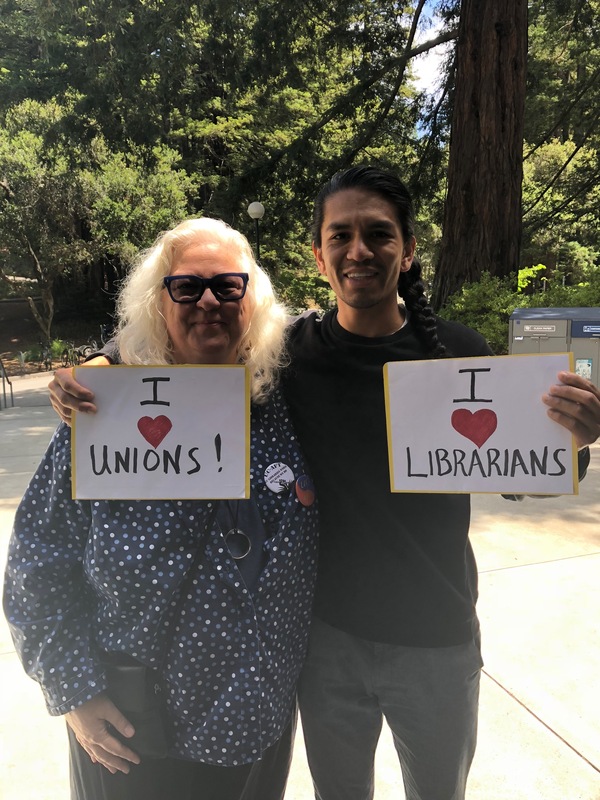 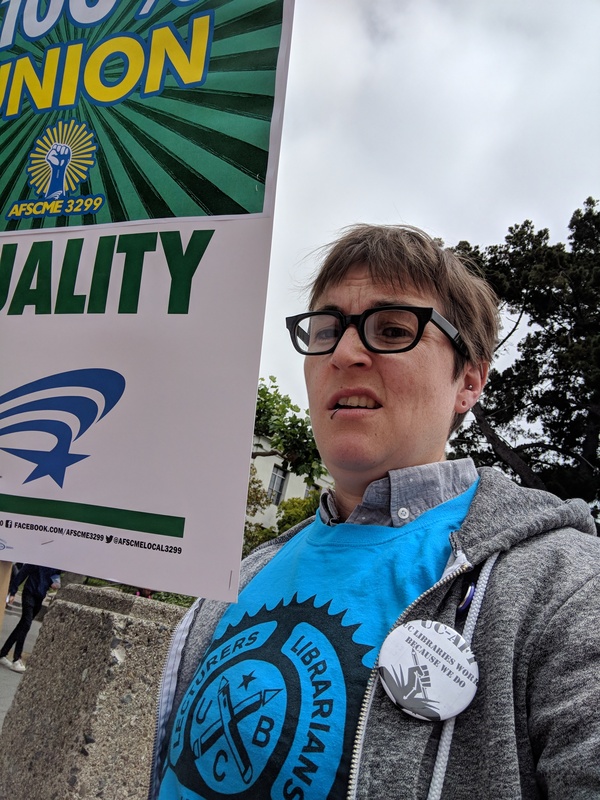 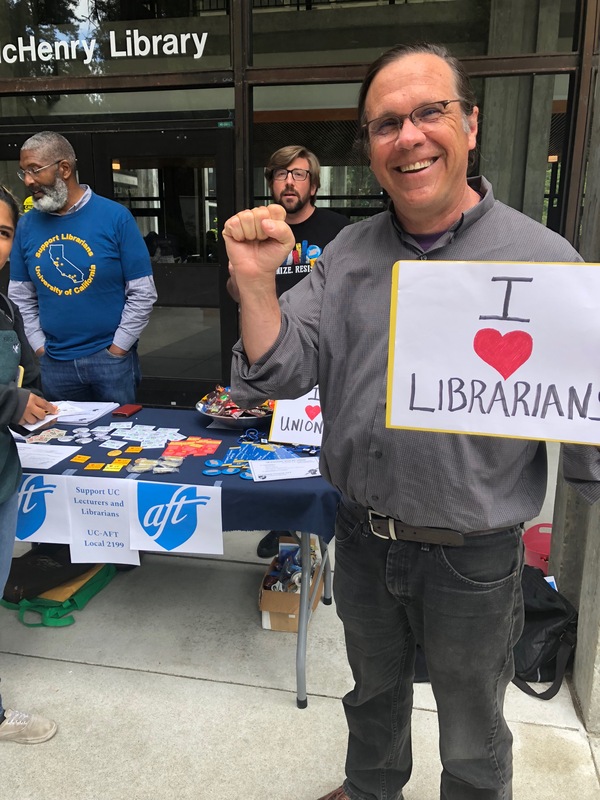 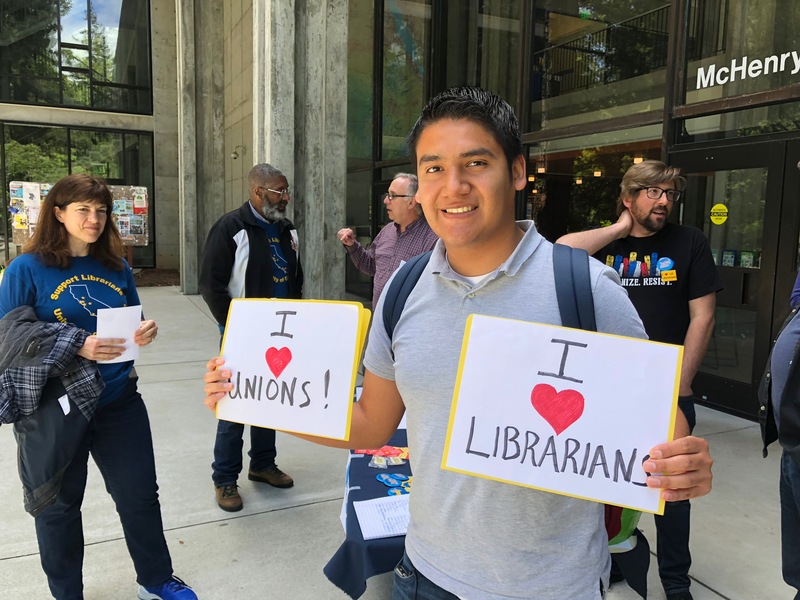 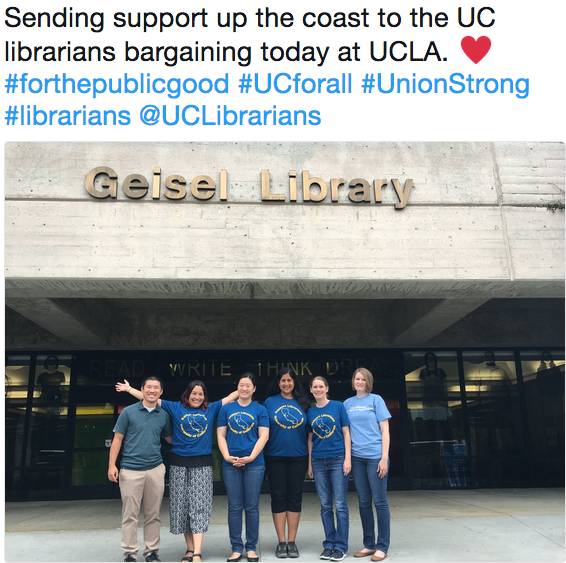 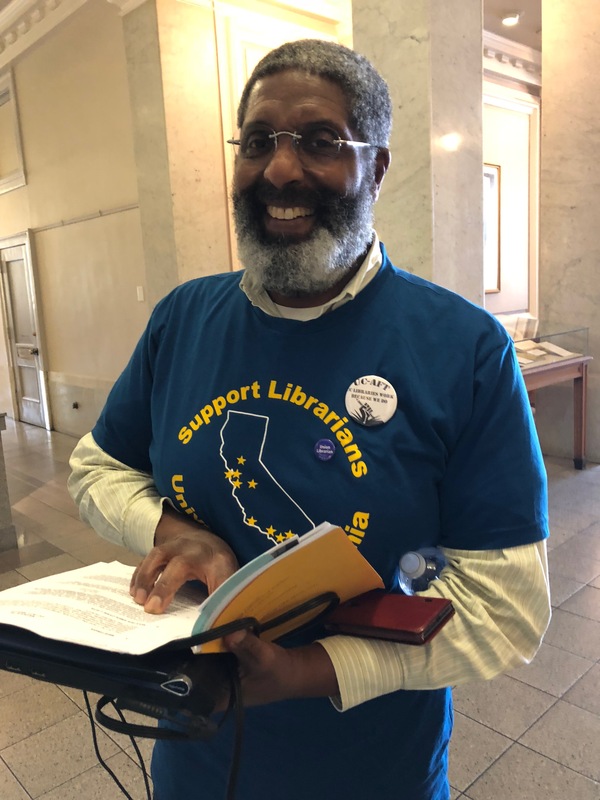 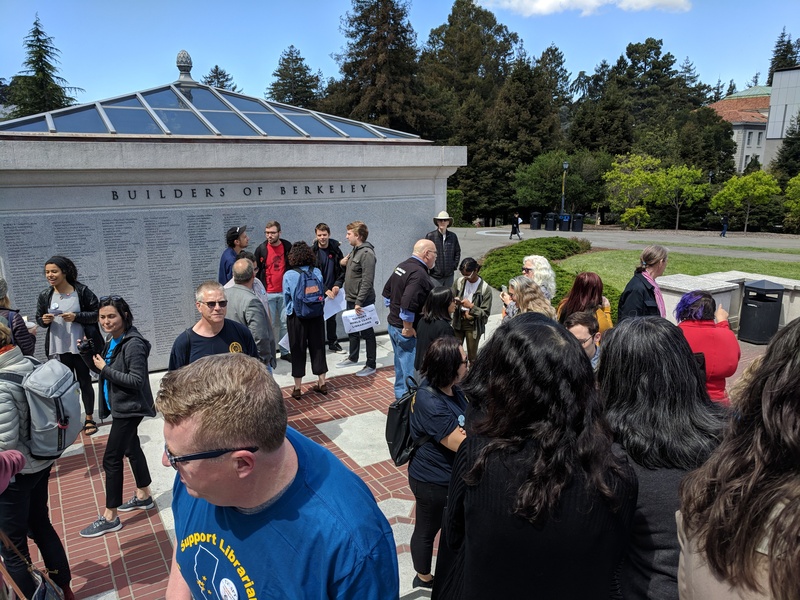 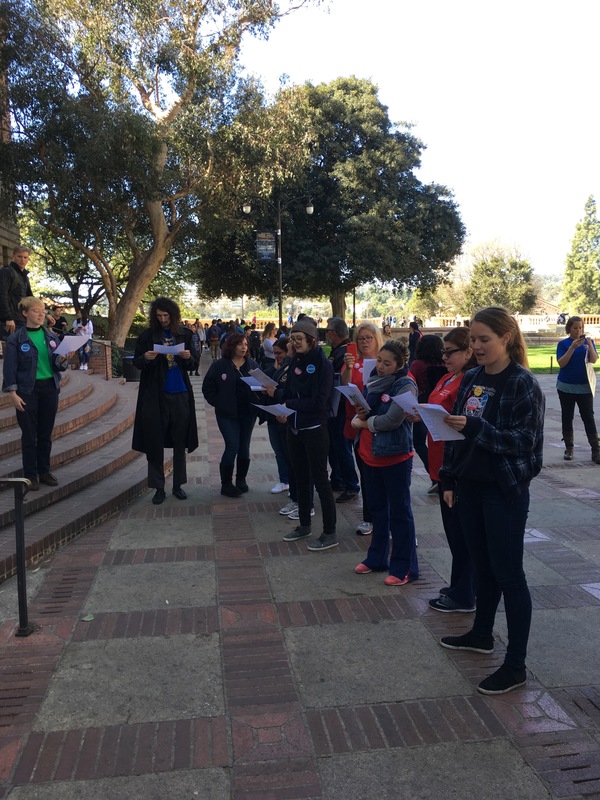 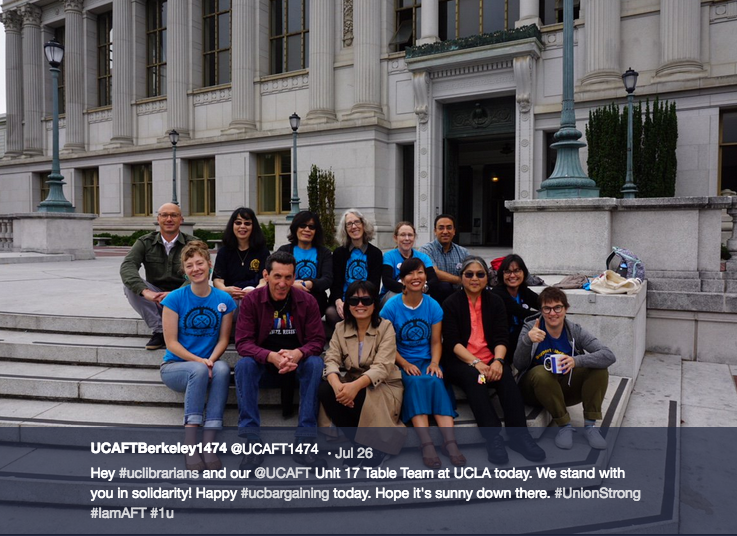 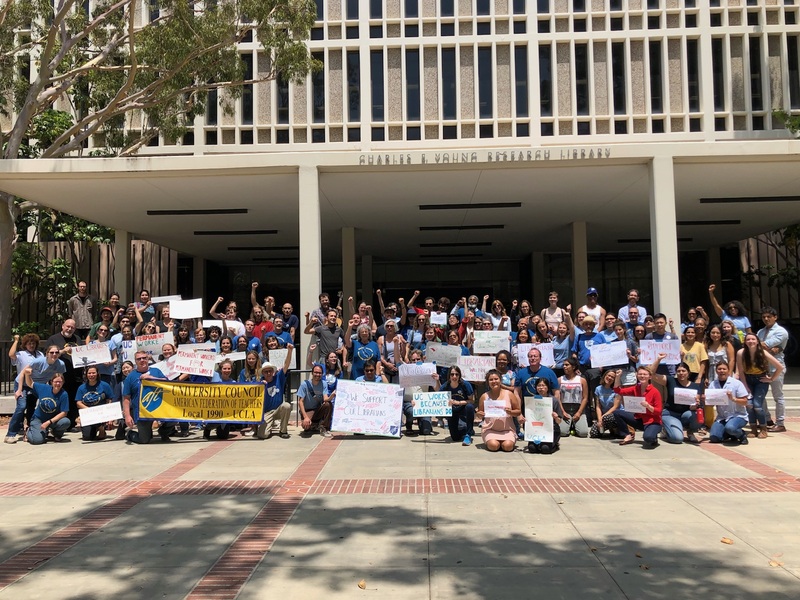 The union’s grievance surrounding the situation for Temporary Librarians in UCLA Special Collections (which is separate from the bargaining session) is still not resolved, and the grievance is now headed to arbitration. 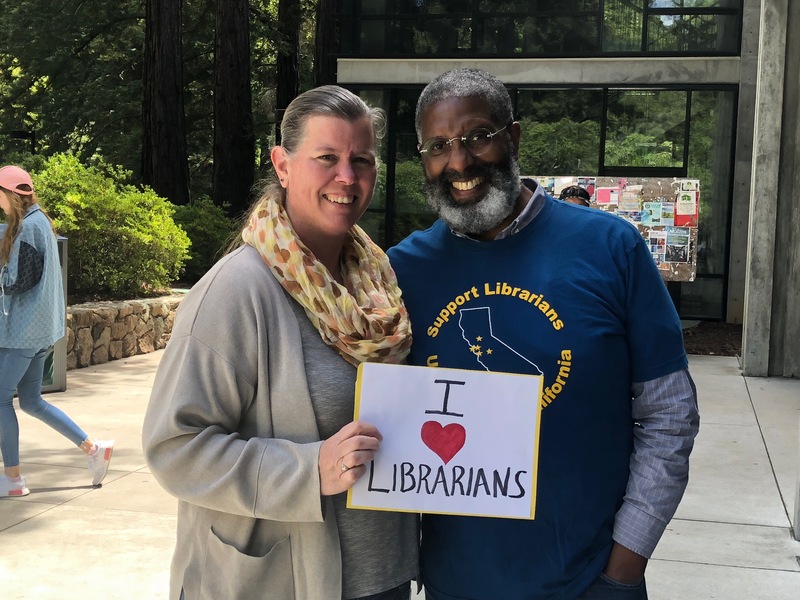 There was much discussion of the needed changes to this article, to allow librarians to exercise the flexibility they need to effectively do their work, whether it’s ability to go to conferences, or work from home when appropriate. 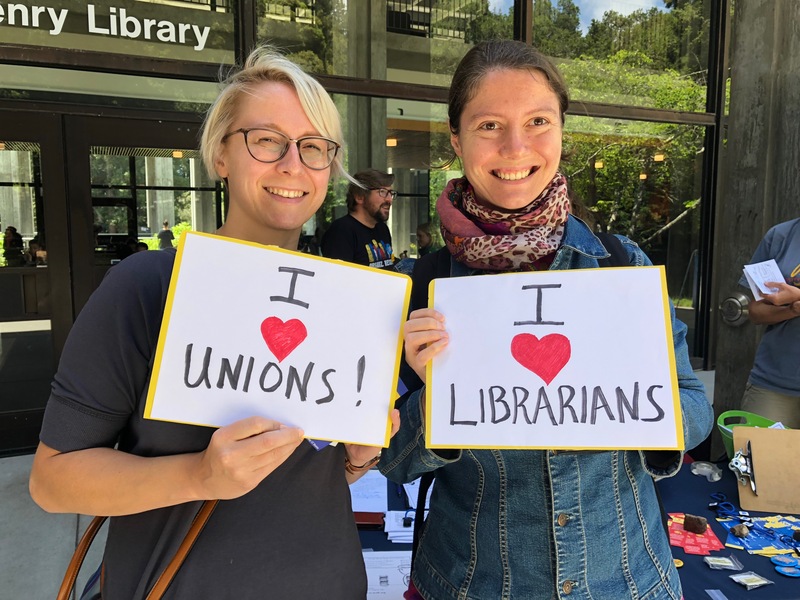 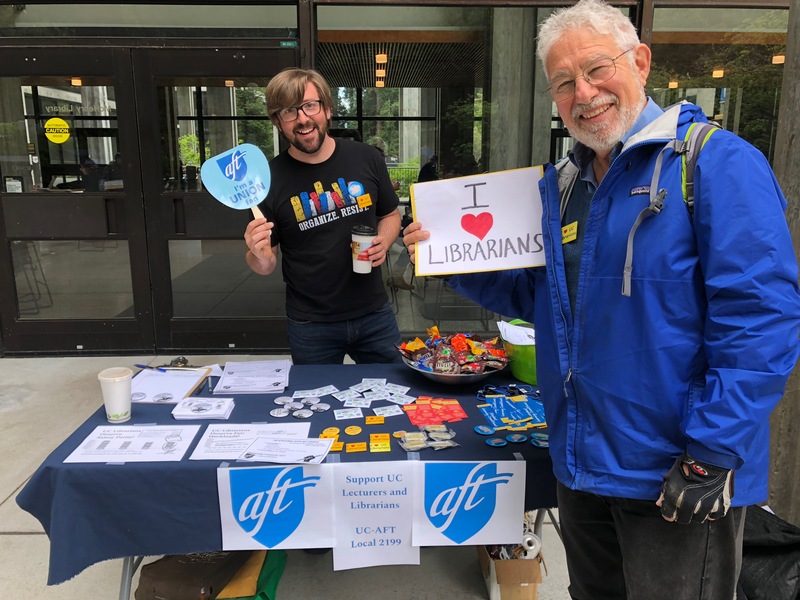 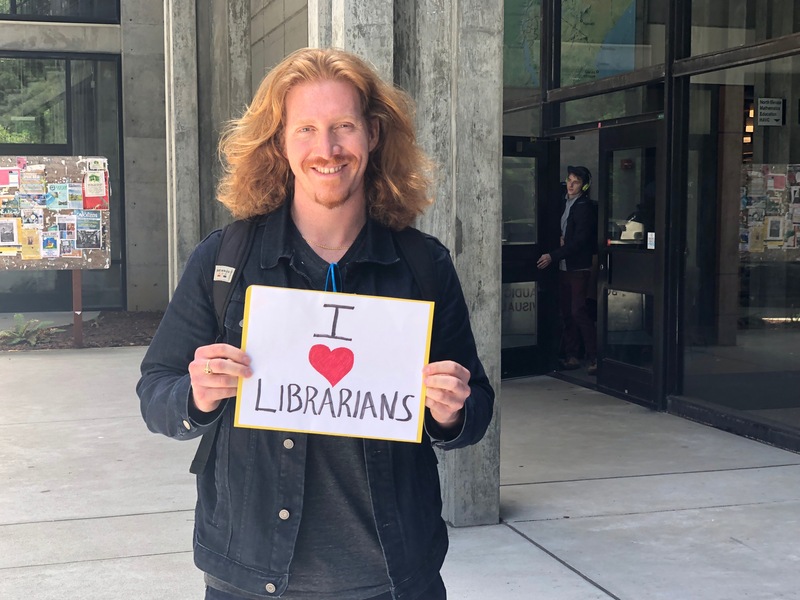 UCOP offers no solutions to the specific cases we have noted where flexible work arrangements were summarily denied and librarians were left without recourse. 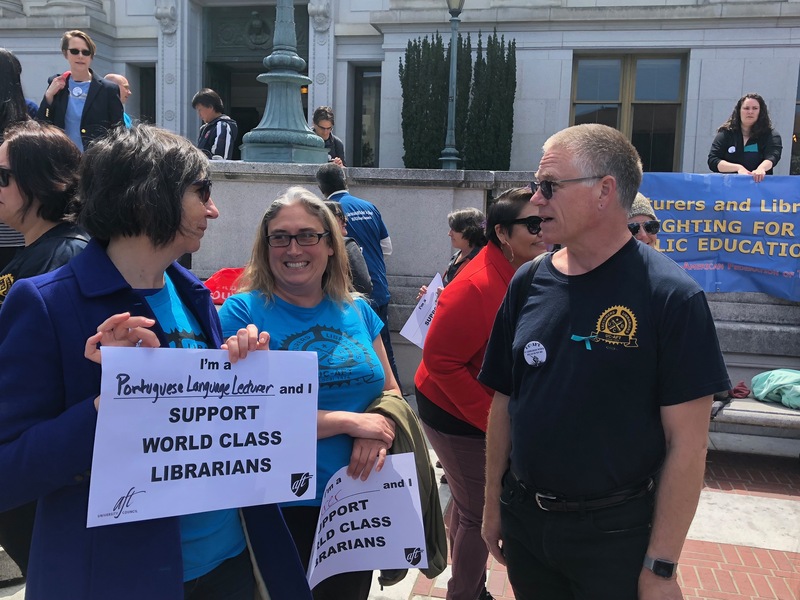 Current contract language says decisions should not be “arbitrary or capricious” but then a sentence later says “this article is not subject to arbitration” – leaving no recourse for librarians if the request is handled inappropriately. 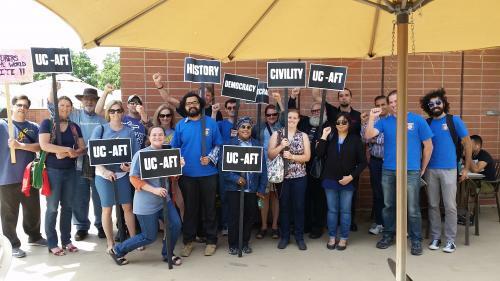 UCOP said they would discuss the issue and get back to us. 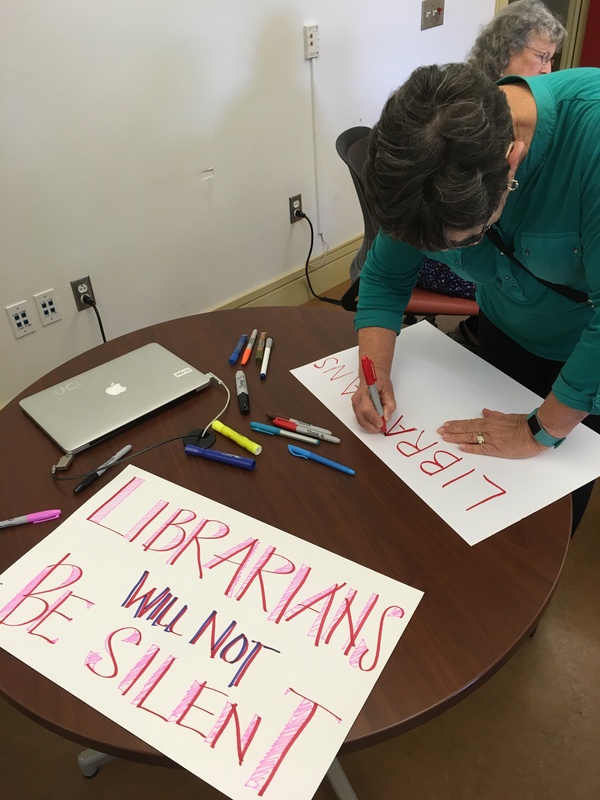 Among several technical issues, the central issue is requiring advance notice to a librarian that is being reassigned, allowing time to respond to a change in work duties and subject areas which can have a detrimental impact on a librarian’s career. 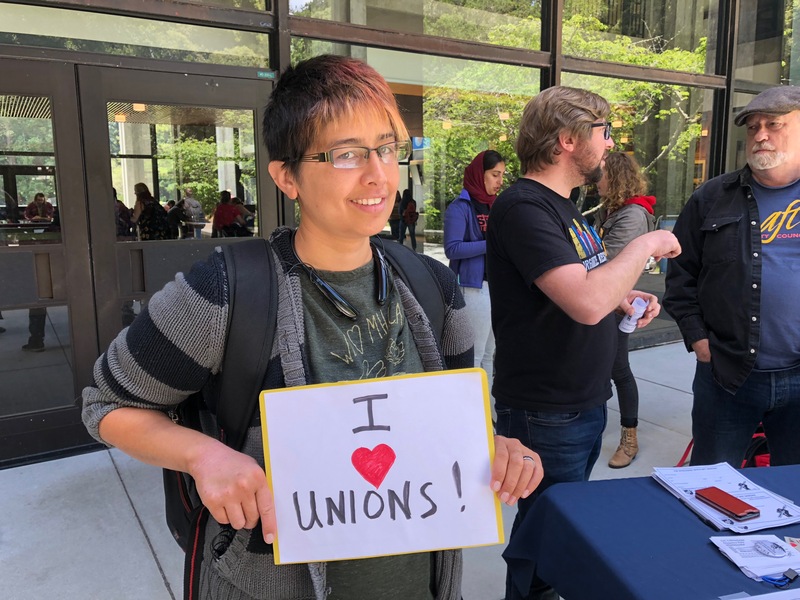 There’s also new language proposed by UCOP that enables easier movement of unit members into administrative positions to fill vacancies, which we oppose. 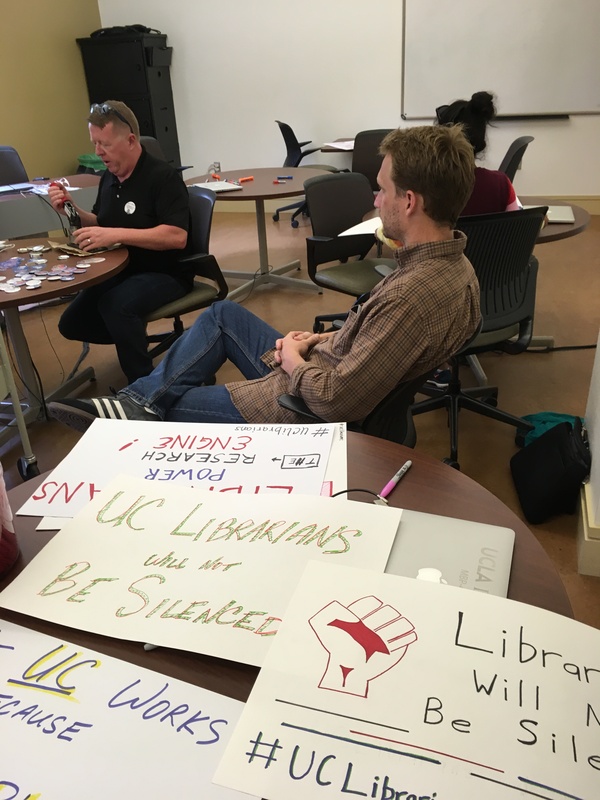 UCOP said they would discuss these issues and get back to us. 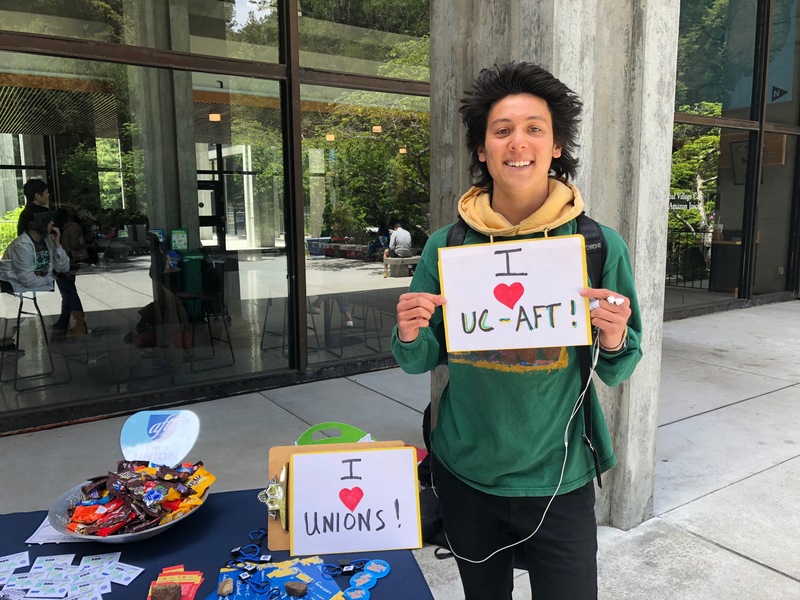 The central issue in this article is the eligibility for housing programs, which is currently left to campuses to determine via local policies. 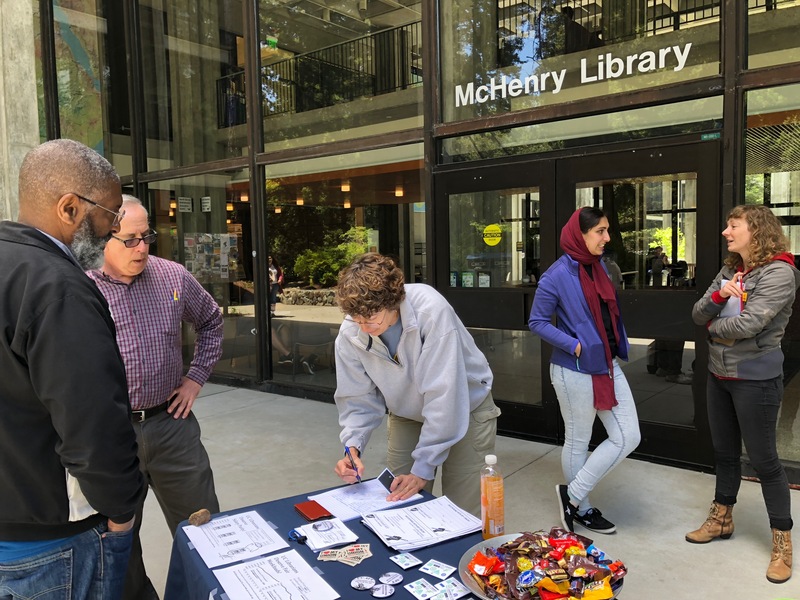 We are simply seeking eligibility on all campuses with such programs. 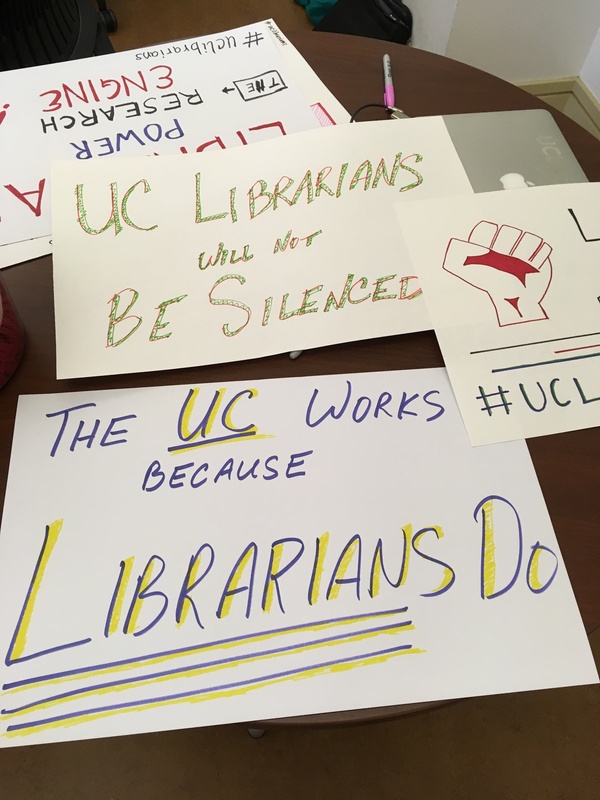 UCOP negotiators simply reiterated their belief that current contract language is sufficient. 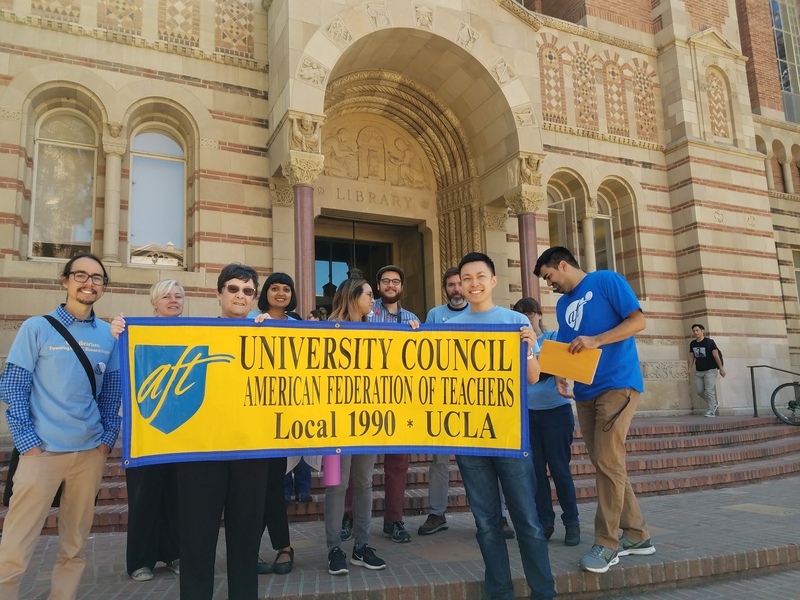 Before and after lunch, informal discussion was held regarding a salary model UCOP is still formulating; we can’t provide any details on that until UCOP is ready to go on record with their proposal. 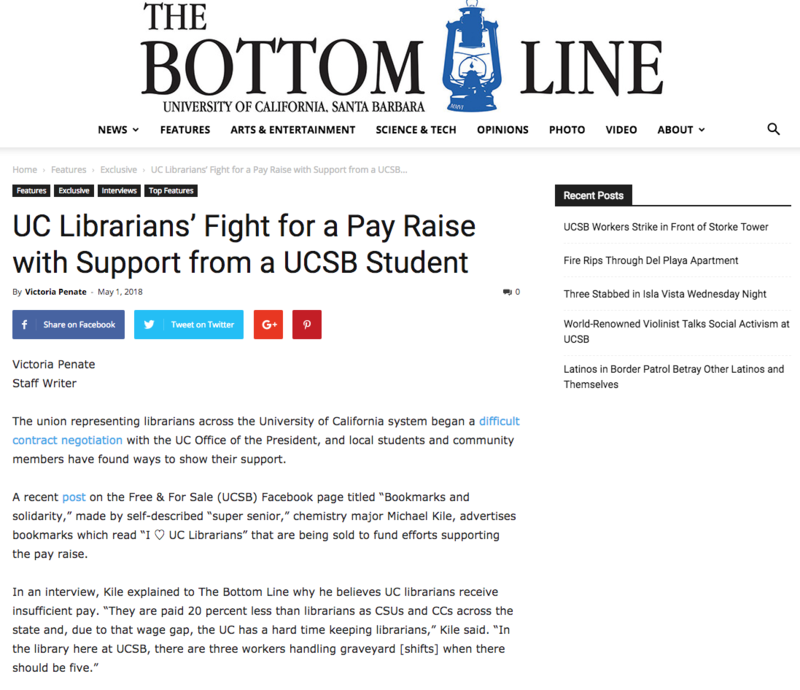 We can say we are encouraged by the progress in this discussion, and we look forward to a formal salary proposal. 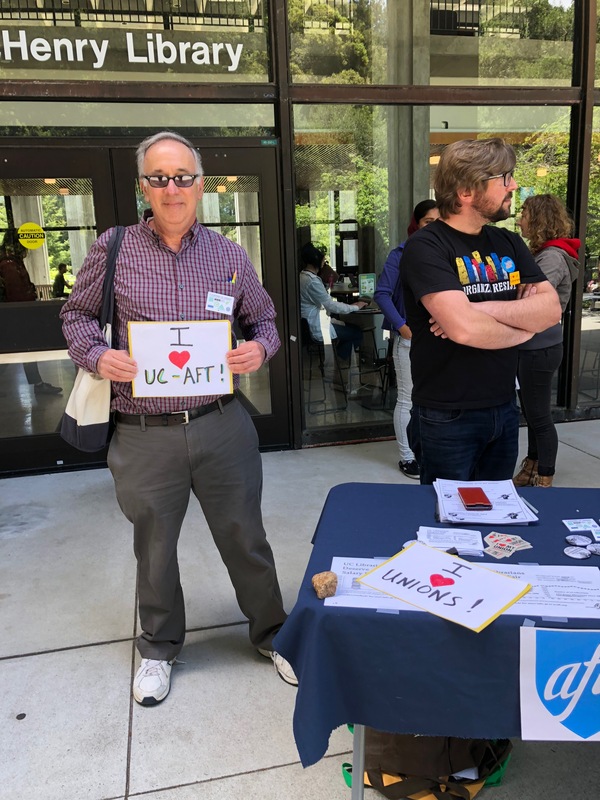 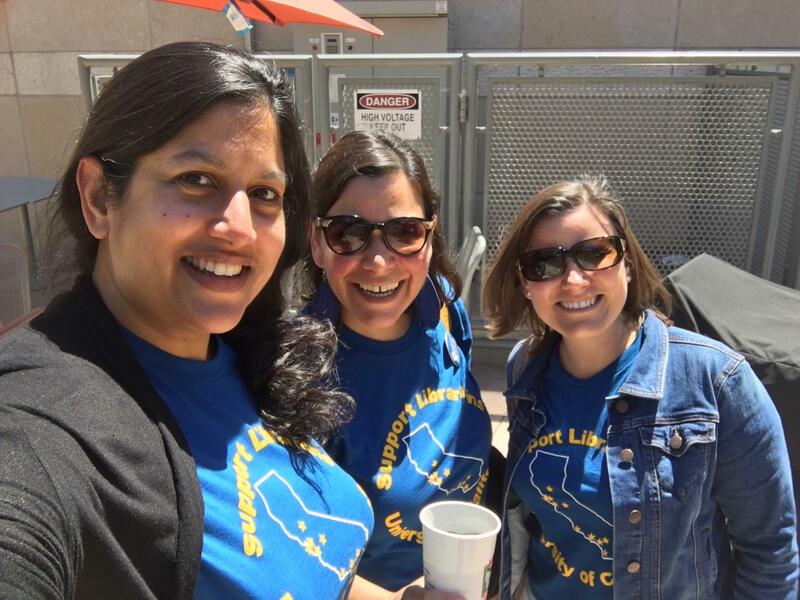 At lunchtime we stepped outside of YRL where our members were conducting a bake sale fundraiser for the UC-AFT Strike Fund. 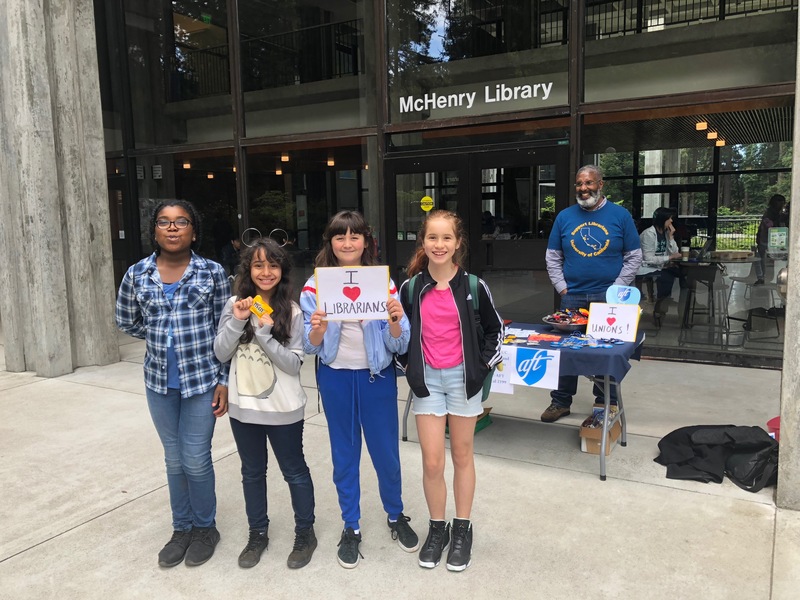 Amazing alfajores, bunches of brownies, cookies, pastries and candies attracted dozens of customers, who happily contributed over $500 to the cause. 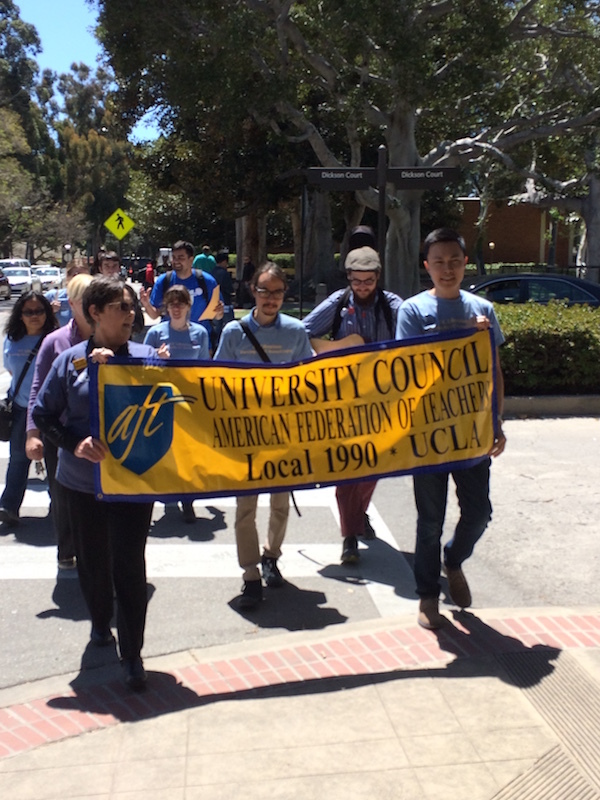 We’ll be providing more information about the Strike Fund and the bake sales (another was held at Berkeley as well!) 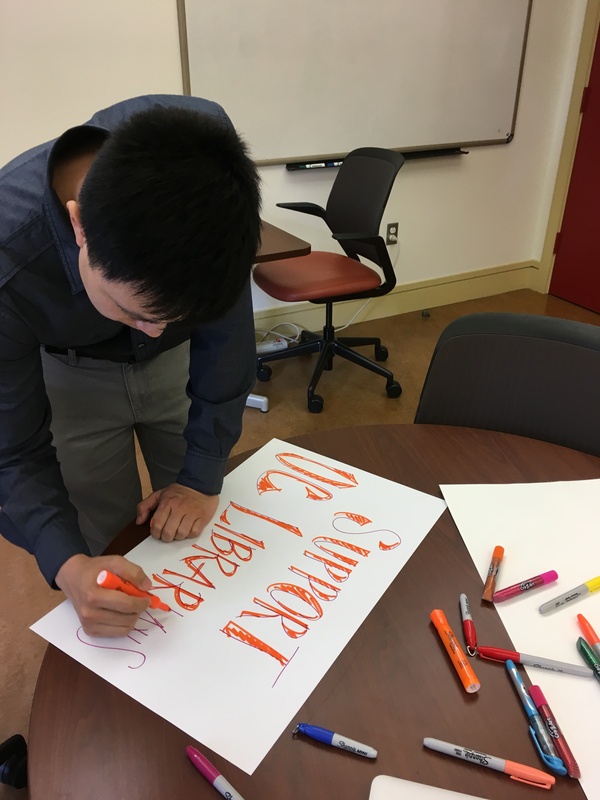 in the coming days. 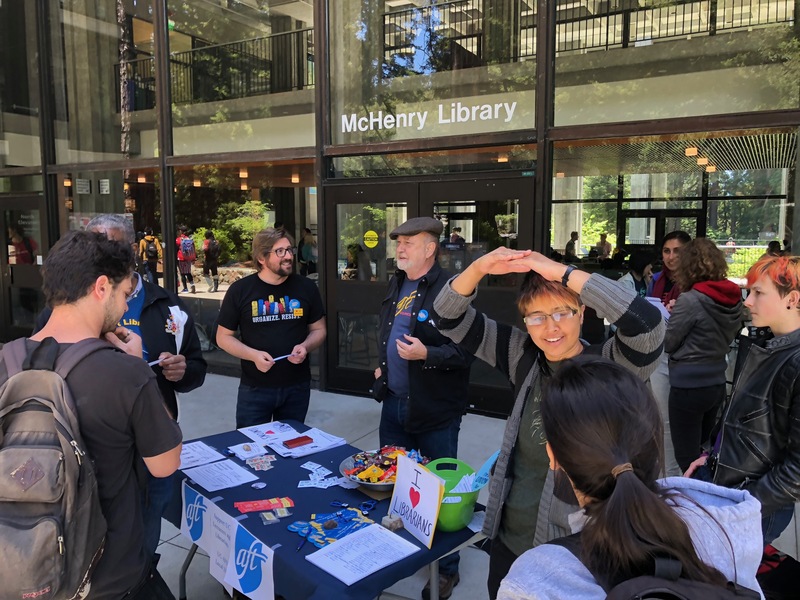 After lunch, we returned to the table and discussed their salary framework some more, and some further questions were asked about the articles above. 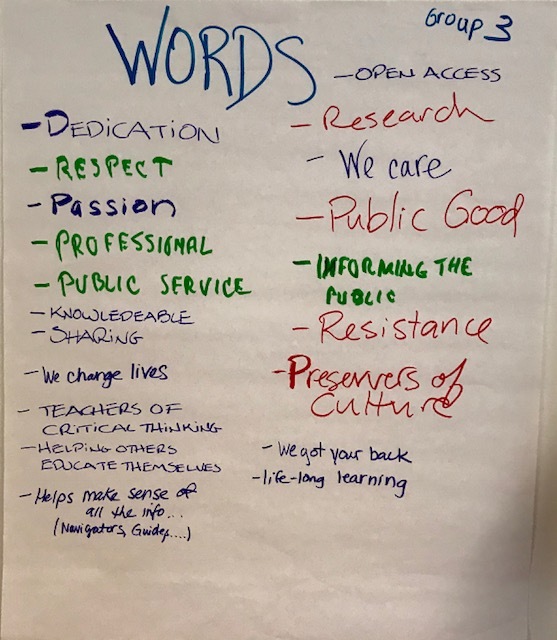 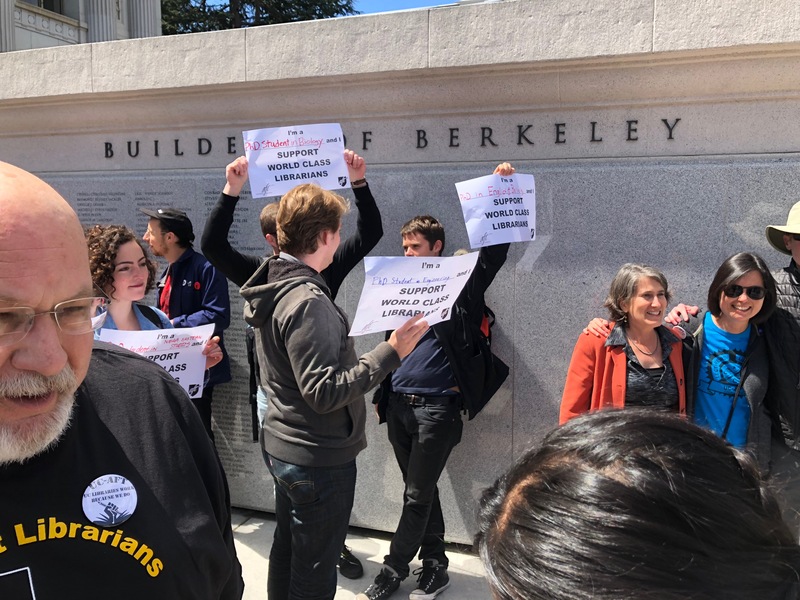 Finally, Academic Freedom was raised briefly by our side, seeking details on the new “systemwide workgroup” to address academic freedom rights for all academic employees, which convened (online) a week ago. 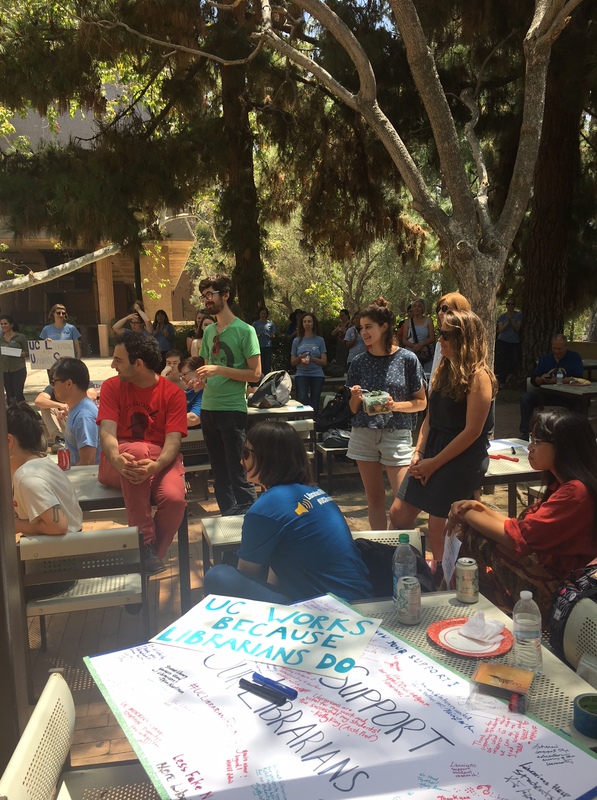 However, we were told that “Academic Freedom is not a subject of bargaining” and that they would only answer our questions off the record. 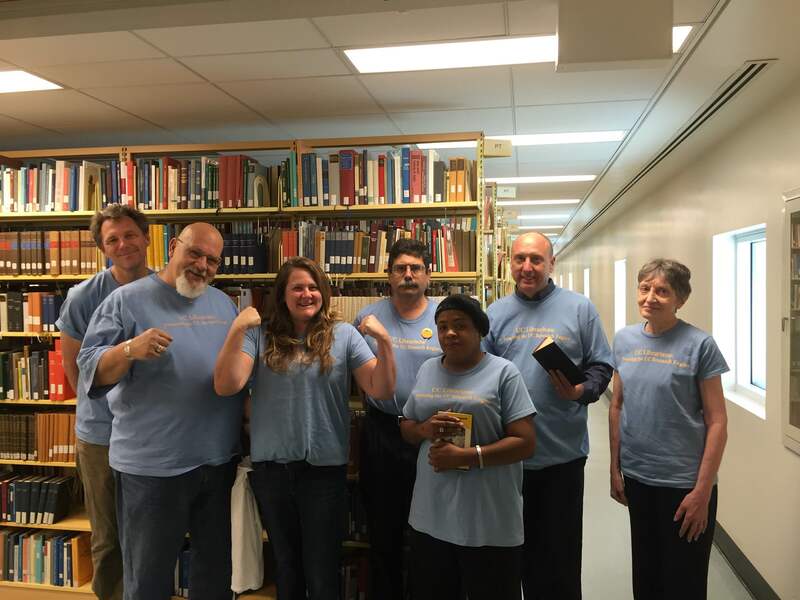 We agreed to ask our procedural questions about the workgroup off the record, but we rejected their assertion. 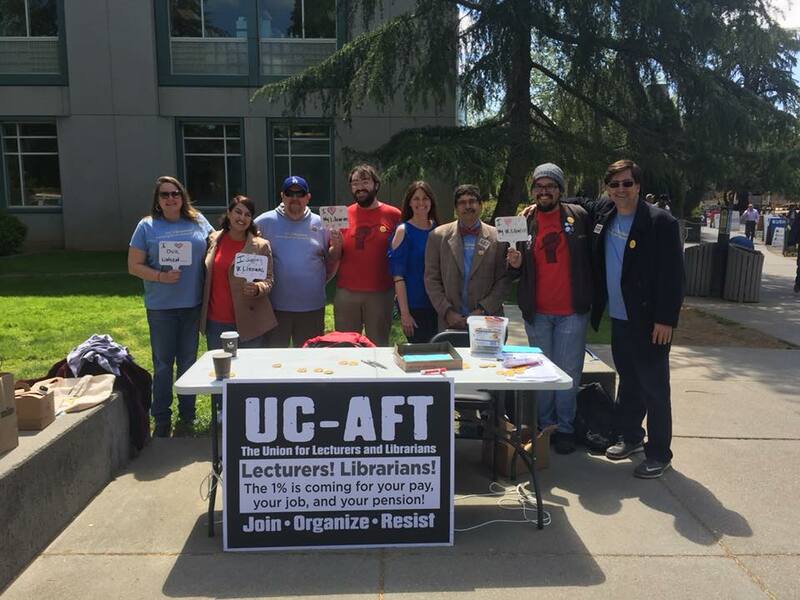 Academic Freedom absolutely remains a subject of bargaining. 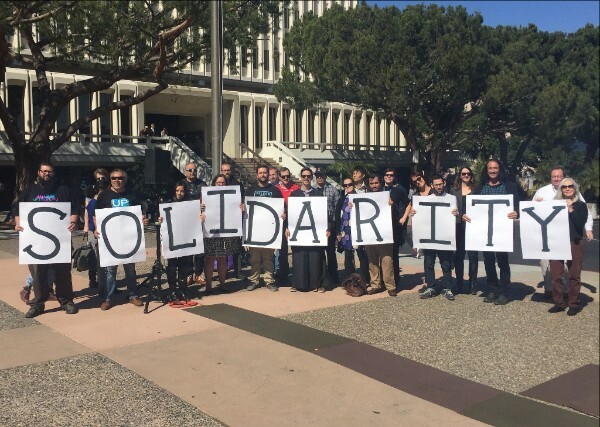 We will continue to raise the issue going forward. 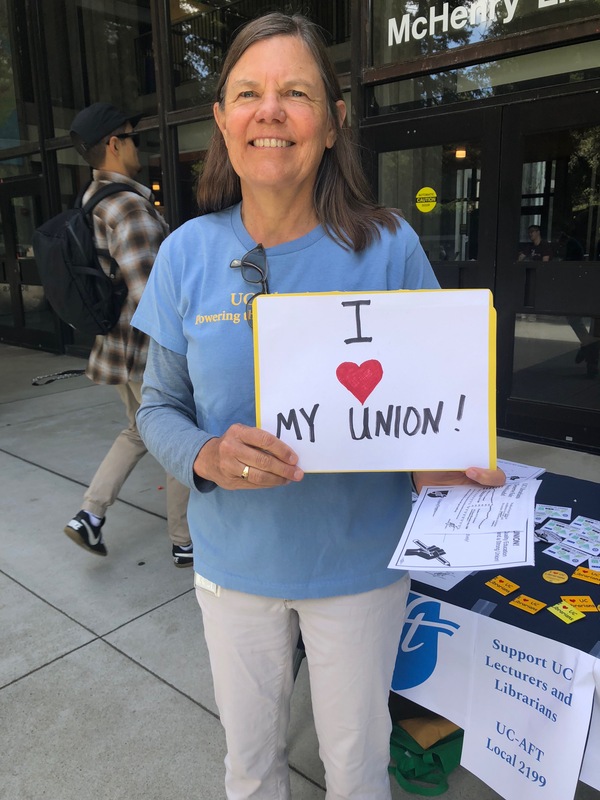 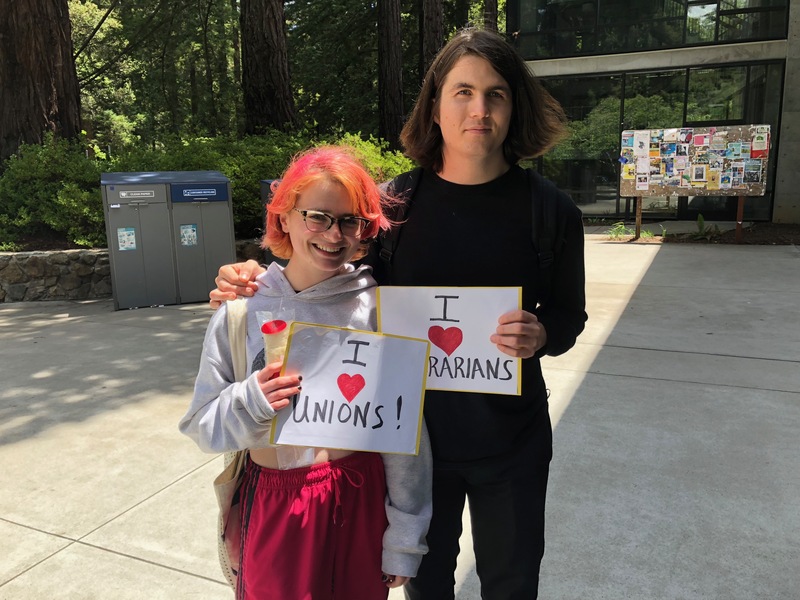 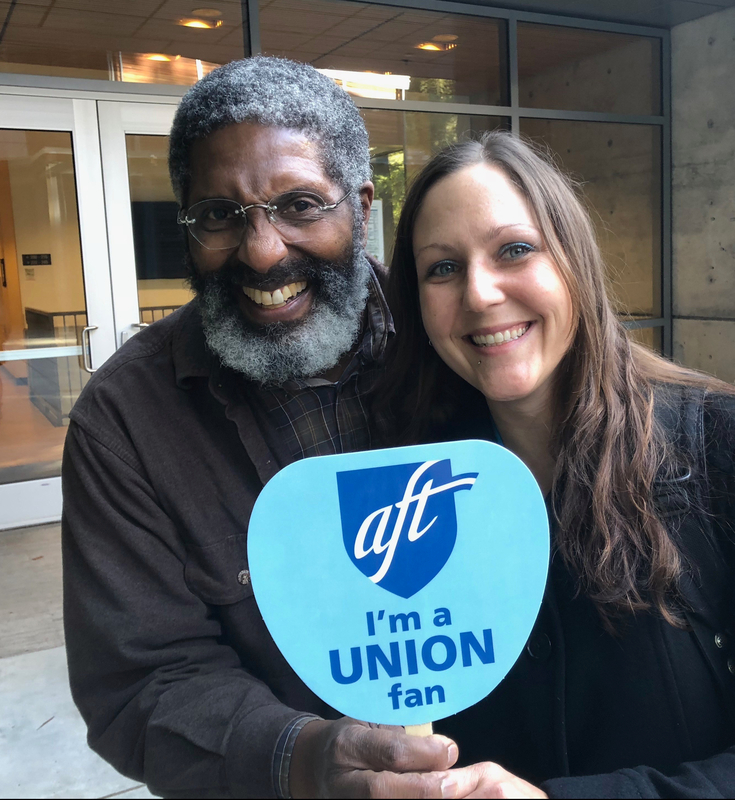 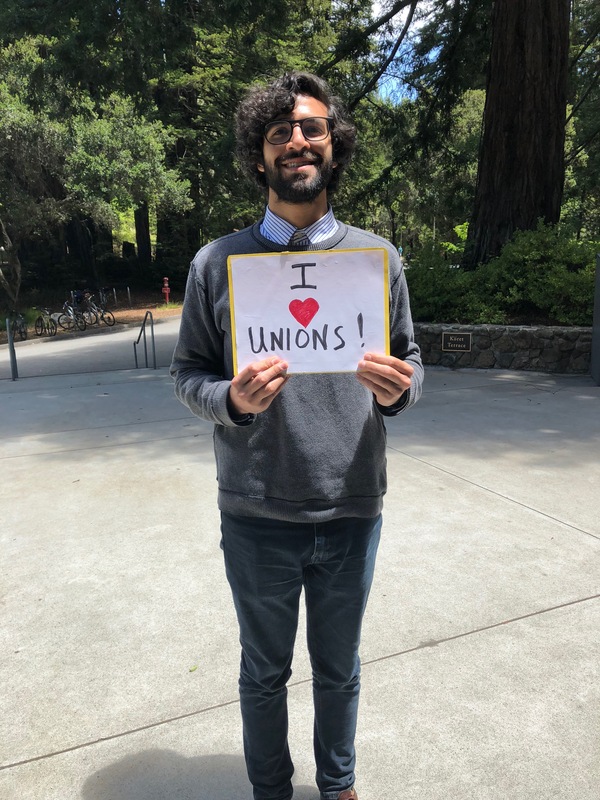 Our next bargaining session is on Friday, February 22nd on the UC Santa Cruz campus.